Since the publication of my book, a number of people have requested me to create a place where we can carry on a discussion specifically related to the topics in that text and where they can directly address issues and questions to me. 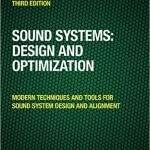 In addition to those specific topics in the book, my intention here is to set up a forum where people can talk about a range of issues generally related to design and optimization of sound reinforcement systems. I will have the ability to add features to this blog site, and so I am viewing this as the beginning of a sort of experiment. Naturally, the input of others in the field is welcome in regards to any of these topics. But, at least for now, we have set up this blog in a format in which I will write comments/articles, etc. from time to time and people can come in and directly comment on these or they can comment on any of the topics in Sound Systems: Optimization & Design. For now, if you want to originate a topic, bring up a particular issue or some such thing, you can email me through the blog. I will try to respond on the blog, assuming it is general enough in subject matter as to be interesting to the professional audio public. If you want a question answered privately (i.e. you do not have a matter of general interest to discuss) you can contact me through my web site www.bobmccarthy.com, otherwise, we’ll keep it here. It would be great to have your input at the RA forum. http://www.rationalacoustics.com/forums/ I think it’s going to be a friendly place to post. Only people interested in system optimization will be hanging around over there. Hi Bob! I`m spanish young engineer, music, sound tech and etc, etc. I recently bought your book and so glad meet this source of “light” in this “medieval acoustic era”. Are you thinking came to spain for a masterclass? It would be great! Only thank you the effort to transmit your experience. Thanks for your kind comments. Yes we are working right now on scheduling a seminar in spain. It looks like it will happen in the late fall – Nov/december range as part of a 3 city European sweminar tour. I am curious about whether you have the spanish translation version or the english version. The Spanish version is finished but I have not heard yet whether it has been shipped out. We will do a Spanish language seminar next month in Mexico city also. I have the english version, some expresion and “jokes” are,too difficult to translate, and sometimes I have to “re-read” various paragraphs. Understand english and acoustic-electric issues at the same time its a hard exercise, but it has rewards. Although speak english is the most challenger to me :). Ough! The Nov/Dec seminar would be a good dates for me, in Nov I went to Mauricio’s seminar in Madrid. Meanwhile I’ll have my “ears” wide open if you came soon to Spain. The Mexico seminar its too far for me, I suppous Mauricio its behind the spanish, if I ain’t wrong. Thanx for your words and time, if I have a good question about sound system optimization it will be good chance to ask in this blog. Im aligning systems using Smaart and am wondering if there is a right and wrong way to phase/time align a system. For example the same results can be achieved by using delay and different filter slopes or orders on a DSP. My experience has not come up with a one-size-fits-all solution, and yet there are pretty clear ways to tell what works for a particular application. There are many different options, choice of corner freq, slope, level and delay (all of these being applicable to either side of the equation in equal or unequal measure). The key thing is bringing them together within the working range of the drivers and such that you obtain the widest angular spread before cancellations start creeping in. This can be found by moving the mic around in the xover range. So rather than taking single measurements straight in front of the stack I should be trying to align in as wide angles as possible so it sounds more even at the wider degrees of dispersion. It seems obvious now you’ve said it. A single position central between the drivers being aligned is the logical starting point, but much can be gained by incremental movements in both directions off the center. If the drivers are vertically displaced you need to look in the vertical plane and if in the horizontal plane likewise. The interaction will be asymmetric (unless you have 1 central driver crossing to 2 drivers) so BOTH directions need to be checked. The question is whether you can get the xover to hold over more than just the centermost location. I have much more to learn on the subject and will try some more experiments next time I put up some different rigs, and have time at the gig! Im also enrolled on the Meyer Course “Fundamentals of System Design, Implementation and Optimization” so hopefully that will offer even more insight. Why isnt this blog more busy?! Just wanted to say thank you again for a (another) wonderful and inspiring class this week. It truly is a pleasure learning from someone who so obviously enjoys what they do, has such a commanding grasp of the subject matter, and who dresses to the nines. You are truly the Jedi Master of the industry. Please let us know when you are in town next, and if you would ever like to see/hear “O” again. Enjoy the “500”!